The current population of Melksham has become used over the past generation to a fourth grade railway provision, whereas it's been second class at least in other rail-served towns. Some people will have an instant desire to switch from private car journeys all the way, from driving to other railheads, and bus on and from the first weekday of a new service, and there should be adequate provision for them. We need to bring provision up to second or third class in order to avoid a bubble of enthusiasm bursting for many in the disappointment of insufficient provision between the trains and their homes, businesses and the places they are visiting. What metrics might we expect to see at the station, using the evidence above, should we have things properly in place? And remember that those figures are based on usage at just a half of the level of Wiltshire's least other used town station from 3 years ago. Allowance should really be made for parking for 300 pedestrians, 150 cars, and for 80 people arriving at the station on a connecting bus service. What was included in the LSTF bid which was granted in full well over a year ago? Now - there is an awful lot of good in what Wilshire Council and First are doing and have already done. The improvement in train services to Melksham will be fantastic. The consideration of health and safety at and on the way to the station, as witnessed by their early provision of extra road markings, has also to be a question looked at first and foremost. There is a good footpath with a raised curb along most of Station Approach, so any additional lining work will be in the immediate vicinity of the station. What is of concern is the disappearance of most of the measures on which the money was awarded, to the extent that improvements are likely to be seen as a movement up only from fourth rate to third class, with other stations in Wiltshire already being second class. And most of us will use a second (standard) class service, but we have to question what loss of potential use we'll see if it's third class. OK - there you have the metrics of what we can anticipate in terms of traffic, a listing of the measures promised in the LSTF bid, and a list of what is planned for the opening and in the second phase. I understand a third phase is planned, but this service needs to take off from the start and at the latest adequate (second class) provision needs to be made by back-to-work day in the New Year. We can sell "teething troubles" and "learning curve" in the run up to Christmas! From the Town Centre and from the A365, these are already adequate for the increase traffic. Improved road markings at the station are to be applauded, and it will be nice to have the underpass smartened up. I don't see a need to increase capacity there or alongside the A365 for pedestrians, as there are already the capacity that was put in for floods of school children when the secondary school was at George Ward. From Foundry Close, a multistory town house development with limited parking, it's 50 metres to the station if you can climb a 2 metre fence, or 700 metres including two crossings of a trunk road, or a walk along the A350 without footpath, if you can't. Wiltshire Council owns the land on the station side up to the fence - it's a trackway that can take vehicles followed by about 8 yards of rough ground. On the Foundry Close side, a spur off the roundabout leads right up to the fence. At the least, a fence panel should be be removed to allow pedestrians and cyclists through. 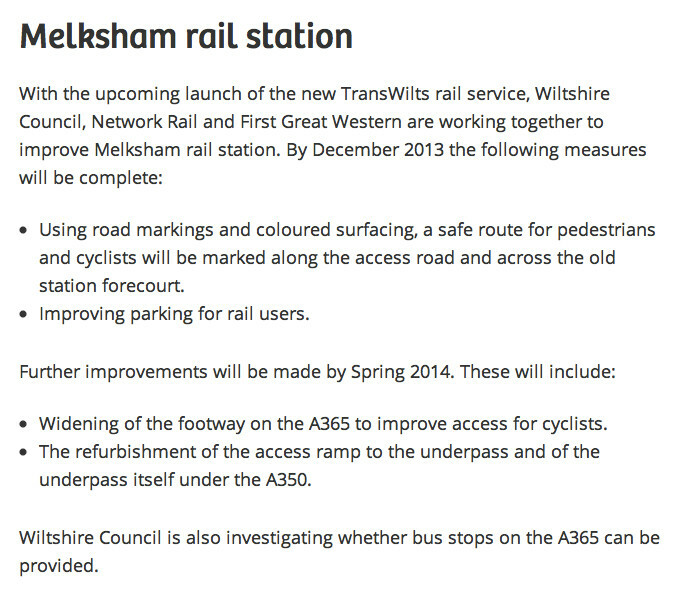 This will also save round-trip walking of around 1 km for the northern section of Melksham to the station. We note that gas tanks have appeared just to the side of where a pedestrian path / cycle way would go, and are seeking information and assurances that these do not prevent foot, cycle and bus traffic from using this access which was planned in the LSTF bid. In 2009, Wiltshire Council purchased land from BRB Residuary for future station use, and promised that any future lets would be short term. AJ King moved out quite soon thereafter, leaving an area where hundreds of cars could be parked right opposite the station. This area has been relet to a heavy plant hire company, and we were re-assured that any relet would be short term only so that the land could be used for the purpose for which the council bought it when the time was right. That time is now; however, there is some doubt as to how "short term" the let of the land is. I have correspondence telling me that we can only expect a handful of extra parking spaces in time for the improved service, which at best would mean Station Approach lined with cars if the intended area isn't available. An extra driver shift on the town bus - running a service to connect with outgoing commuter trains in the morning, and to connect from incoming commuter trains in the evening, was included in the LSTF works. However, I have now been told that consideration is being given to provision of a "demand responsive" alternative; under usual ways of working, such systems need to be booked ahead of time and I question whether people would use this for the town - in other words, are we setting ourselves up to fail? The survey figures above indicate that very many fewer people would use demand responsive than a bus service that can be taken without booking. Town bus should serve station / trains. X72 / 272 - stop at Roundponds is too far away. Timings on Faresaver (X72) connect with trains quite often during the day and indeed we have suggested to Faresaver that they send certain journeys via the forecourt. But there are some very unfortunate failures to connect, and some timings are going to mean people left stranded if bus or train is a few minutes late. 234 / x34 should run through station yard when Foundry Close cut through is opened. Stop at top of station approach for 272 / X72 / Zigzag would be welcome as being better than Roundponds, but still pretty poor. Up to date but information on that stop for all services calling there (might sound obvious, but rare in Melksham!) should be provided, and of all the stops in Melksham this is probably the one that should have a live departure screen. Provision of correct buses, with no extra vehicles at all, will results in a substantial bus ridership increase. Failure to provide will result in not only loss of bus traffic, but also loss of train traffic to and from Melksham. The current at-station information comprises 3 panels of display located so that they are hard to rad in the dark, and containing the Cardiff to Portsmouth timetable sheet which shows Melksham trains, but not connections to Bath, Bristol or London. For arrivals in Melksham, there are two further panels at the top of Station Approach (100 metres from the station), which contain directions to the town, and where the bus stops are. I have spoken with Nick Reid, Area Station Manager with First, and with the Melksham Railway Deelopment Group, and agreed that the best improvement on notice boards would be to add a 3 panel, double sided board along the line of the station fence under the lights. Extra panel / information to provide additional timetable sheets, rail offer marketing, and town and community rail information. We need to say "Welcome to Melksham" and have information (updatable by the CRP / MRDG?) on such things as taxi numbers. The screen which provides train departure updates, installed by First a couple of years back, is pretty close to perfect - it would be even better if it hadn't broken down so often, and if delays were notified rather more logically. It includes an emergency button, and a travel enquiry button which are very useful indeed. As it stands, you can get on the train and (usually) buy your ticket from the conductor. We question whether the conductor will have time to issue all the tickets with enhanced numbers using the train, and at times the conductor doesn't have a ticket machine. People cannot collect tickets purchased in advance (sometimes much cheaper than buy-on-day tickets) from the conductor, and people have read so many warnings that they can be fined for getting on a train without a ticket that they don't like buying from the conductor, Melksham being an exception. a) Carry on "as is"
Option (b) will allow collection of advanced tickets, but is slightly limited on the sale of other tickets and on information provided. Also very expensive and potential high running costs. Probably would not take cash. Note than another local TVM (Ticket Vending Machine) has been withdrawn due to vandalism. Option (d) is seriously possible, except that we understand that commission rates are down 9% to 5% to (now) 3%. Whether at the TIC, and / or from a Community Rail Partnership base in the building in the crane yard / car park is also discussable. I would need to research further about things like how photo cards for seasons are issued too. The only way to get ALL the ticket issuing options is probably (b) AND (c) or (d) and we would need very good figures for those to be supported ing term. First have a team of roving ticket issues equipped with portable "Avantix" machines - just possible one could be seconded from Chippenham for a start up period? Open the Foundry Close cutthrough, and you have shops and McDonald's close to the station. A station office (Crane yard) could sell hot drinks as well as train tickets and provide information. The CRP would be interested in fronting this. There may be a need to increase cycle parking. There is space for a few at the station on the covered platform unit, there are 3 secure boxes, and further provision would be possible in the crane yard. Cycleway - open through Foundry Close, leading to Scotland Road and across the river via existing foot / cycle ways and you have a good route to the National network and to Melksham Forest. Probably need to keep an eye on numbers here, but it may be adequate, a few spaces for 20 minute waits in the Crane Yard? And we should suggest to the local taxi firms that they might like to meet the trains ;-).